Nokia don,t need any introduction as it was most popular brand in past but slowly-slowly it went on floors from sky. Now the company is trying to come back in market under the HMD global. Nokia’s upcoming flagship Allegedly called “Nokia 9” got hands on via frandroid.com by showing its side by side design. 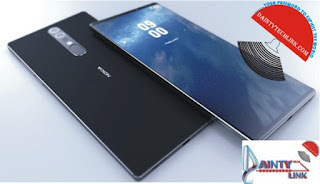 Moving to specs, The Nokia 9 features 5-3-inch QHD 1440x2560p display on front, measured a 530nits maximum brightness according to site with always on display like other Nokia Android smartphones. As other flagship smartphones powering, the nokia flagship comes with Qualcomm’s latest Snapdragon 835chipset to provide it power to handle heavy tasks. As far as storage is concerned, the device packs 4GB RAM and 64GB internal storage capabilities to further expendation up to 256GB via microSD slot. Operating System is Android 7.1.1 out of the box which would be bit old as Google has already launched Android O beta version for Nexus and Pixel devices. The phone is bundled with a pair of earbuds, and a QuickCharge 3.0 fast charger. In terms of optics,the device comes with two cameras on the back of the phone, reportedly a 2x13MP setup. A dual LED flash is under the lenses, as is what appears to be a laser autofocus window. Keep in my mind, this is a prototype version of Nokia 9 and final version come with different specs but very identical to prototype version. The Nokia 9 is expected to launch in July month. As far as pricing is concerned, the phone might launch with price tag of 700$/48,000 INR. We don’t know how it will justify price or not but on paper it looks great. We have to wait final launch to make any decision about the Nokia 9.